The Amiga 3000, released on the 7th of May 1990, had the biggest changes to the Amiga product lineup since the release of the original Amiga 1000. Very early Amiga 3000 machines shipped with a Beta Kickstart 1.4 ROM, and when turned on, gave the user a choice between Kickstart 1.3 or the new Kickstart 2.0, and it would then load the appropriate kickstart from either a Superkickstart disk, or a file on a hard disk, however if the user clicked an invisible close button in the top left of the screen, it would boot with the Beta Kickstart 1.4 ROM, which was from before Kickstart 1.4 became Kickstart 2.0. 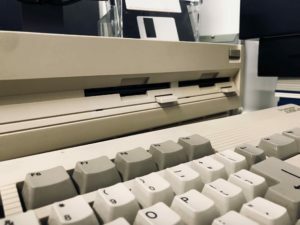 It was the first machine to have System 2 (Commodores name for the release of the combination of Kickstart 2 and Workbench 2), it had a 68030 CPU (The first machine to not have a slower 68000 in it at all, while the Amiga 2000 was available with a 68020 in the Amiga 2500/20, or a 68030 in the Amiga 2500/30, these were in add-on cards pre-installed and didn’t perform as well as the new Amiga 3000 machine), it had a built-in SCSI-II interface, the ability to use SVGA monitors without flicker (thanks to the new Amber chip), it had the new, faster Zorro III expansion slots, and even came with the first high-density floppy drive for the Amiga range, able to store 1.76MB on high-density 3.5″ flopy disks, as well as read and write standard high-density MS-DOS and Apple Macintosh 3.5″ floppy disks. It should be noted that many Amiga 3000 machines shipped with just a single internal floppy disk drive, however it is a source of controversy in the Amiga community as to where is the “correct” location for the floppy disk drive out of the two locations. It seems that some Amiga 3000 machines were shipped with it in the left location, while others were shipped with it in the right location, and there doesn’t appear to be any correlation between which location the drive is in and any other factor. It could very well come down to who personally assembled the machine in the factory. 16 colour maximum in resolutions above 384 pixels wide. Kickstart versions: Early production versions used either a 1.4beta Kickstart Disk and/or a Kickstart file stored on the hard disk. Later production units had a normal Kickstart 2.0 ROM.